Puffed Up | Food and Drink | Style Weekly - Richmond, VA local news, arts, and events. 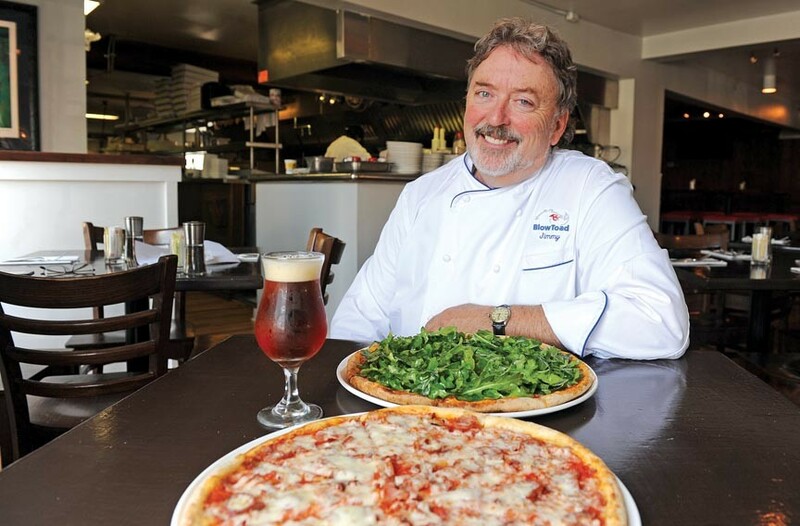 Chef and owner Jimmy Sneed shows the Edwards & Sons pizza with smoked sausage, Surry bacon, ham and mozzarella; and the Surryano pizza with ham, arugula and Parmesan, complemented by a Devil’s Backbone Vienna lager at Carytown’s BlowToad. It's the first question that comes to mind when considering the name of chef Jimmy Sneed's newest restaurant: What exactly is a blow toad? Answer: a rough-skinned puffer fish that can gulp enough water to swell to a sphere, and is prized for the sweet chunk of flesh contained in its tail, for which it also earns the nickname sugar toad. It isn't an obvious mascot for a pizza bistro, but it continues the amphibious nomenclature that chef Sneed seems to favor for his eateries, which have included the Frog and the Redneck (of Shockoe Slip, now closed) and SugarToad (of Naperville, Ill.). At BlowToad, which opened in Carytown in February, these tasty morsels are served tempura style, with wedges of lemon and instructions to eat like corn on the cob to avoid the bone down the middle. They are indeed sweet, crispy and delicious, but are just a sideshow to the main attraction. BlowToad's reason for being is the 12,000-pound brick oven that holds court in the kitchen — and the pizza it produces. The oven is fired by coal rather than wood, which would be troubling to Neapolitan pizza traditionalists, but it's difficult to find fault with the pies that Sneed and his chef de cuisine, Michael Hayes, are creating. The crust is thin, crispy through the middle, and nicely charred in spots, with a lovely hint of smoke. The sauce tastes simply of fresh tomatoes, olive oil and salt, without the overly sweet, cooked-till-it's-brown quality that's so ubiquitous. You can choose from all the usual suspects of toppings, plus some more interesting ones, including lamb sausage, Surryano ham and swinging steak, aka Rocky Mountain oysters or bull testicles. The latter brought BlowToad some early attention when an uninitiated customer ordered the bleu ball pizza without questioning the origins of the meat and became outraged when she realized what she'd eaten, taking her grievance to local television news. A few of the specialty pizzas, all $12, are noteworthy. The Greek, with Kalamata olives, peperoncini, feta and tomatoes, is the best of the pizza and salad worlds in one delectable dish. The ham perfectly balances sweet-salty meat with piles of peppery arugula. Anything with the fabulous ricotta is worthwhile. The combination of smoked chicken, pepper jack and green olives on the chicken is piquant and addictive. To properly wash down the pies, BlowToad offers 24 craft beers on tap and 43 bottled varieties. Diners also can choose from a selection of 40 whiskeys and some inventive cocktails, including the belly-busting employees-only with rye, chartreuse, chili-lime syrup and chocolate bitters. So the pizza is great and the drinks are plentiful. What else is there to know? 1. The scene: On most evenings the bar is loud and crowded. But the bartenders are attentive and helpful, and if you come on a Tuesday, kick the keg night, you can score a $2 draft from the selected kegs. The dining room is less raucous than the bar area and is suitable for families and other groups looking to dine, rather than just drink. Night owls will go hungry no more: The walk-up pizza window is open till 3 a.m.
2. The look: The interior of the place has the same general layout as previous tenant Double T's, with the exception of the reworked bar area where banquettes now line the exposed brick wall, and a style that can best be described as spare. There's no décor to speak of aside from a large painting of frogs jumping across a dinner table, which hangs purposely askew across from the bar, and a television in the corner near the door. Patio tables face the Byrd Theatre and are a hot commodity on nice evenings. 3. The other food: The menu offers more than pizza — appetizers, fish and chicken entrees, steak frites, various sides and a kids' menu also are available — but it all plays second fiddle to the pie, except the dynamite hand-cut fries. The prime rib special ($14), available on Friday and Saturday nights, is juicy and well-cooked but lacks seasoning. The blackened fish ($14) is decent but forgettable. House-made fettuccini ($12) is tasty but dry. The wedge salad is an especially nice version of the classic, with crisp iceberg, smoky bacon, and tangy blue cheese dressing. Desserts include old-fashioned favorites such as tapioca, pound cake and Gelati Celesti milkshakes. Correction: In the print version of this story we used the name of a chef who is no longer with BlowToad.